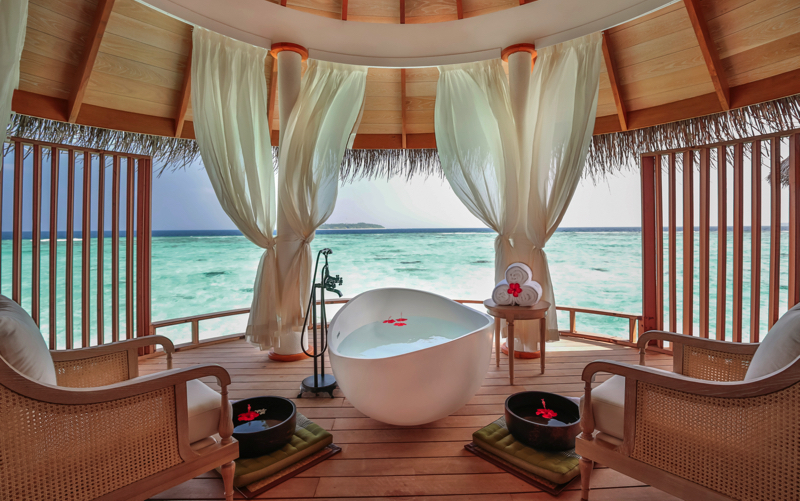 Milaidhoo Island Resort Maldives is a 5* boutique luxury resort in the Baa Atoll, a UNESCO World Biosphere Reserve. It’s just a 30 minute seaplane journey from Male airport. A stunning small island, that measures just 300m by 180m and fringed by soft deep white sand beaches. It is intimate and stylish offering understated luxury. The resort also offers Wi-Fi throughout. 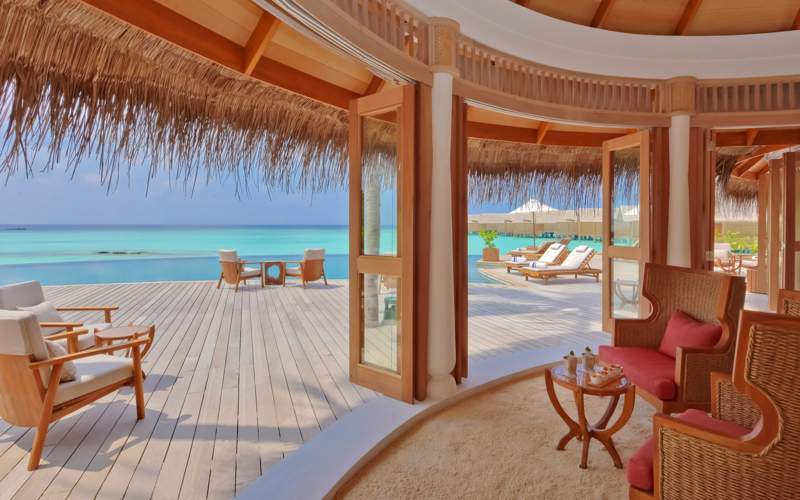 Milaidhoo Island Resort Maldives is a member of The Small Luxury Hotels of the World. 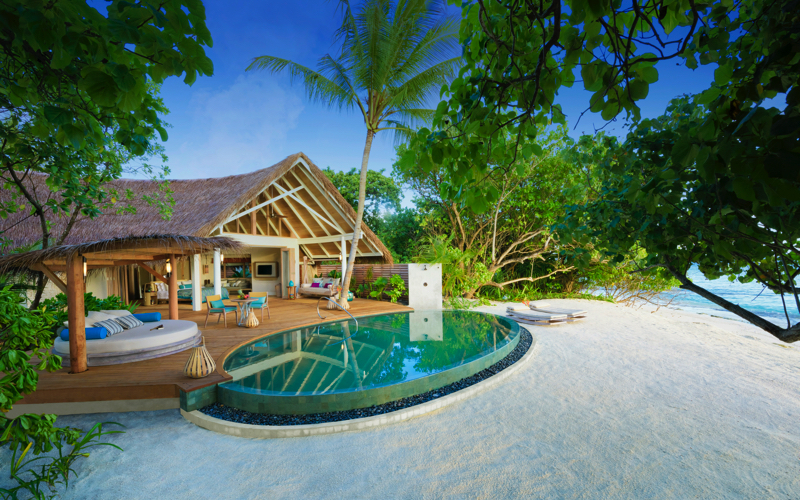 Milaidhoo Island Resort Maldives has just 50 villas with 180 degree panoramas. Choose from beach or water villas, with their own pool, or from a beach or water residence, with separate bedroom and living space. Villas are spacious and light filled, have a large private freshwater pool on the sun deck, a hanging Maldivian swing, a day bed, air conditioning and a ceiling fan. With the residences you will have your very own butler, private chef and outdoor cinema. The house reef lies close to the beach and is great for its excellent snorkeling and diving. The experienced diving team have access to the best dive sites in the atoll and welcome everyone, from novices to experts. 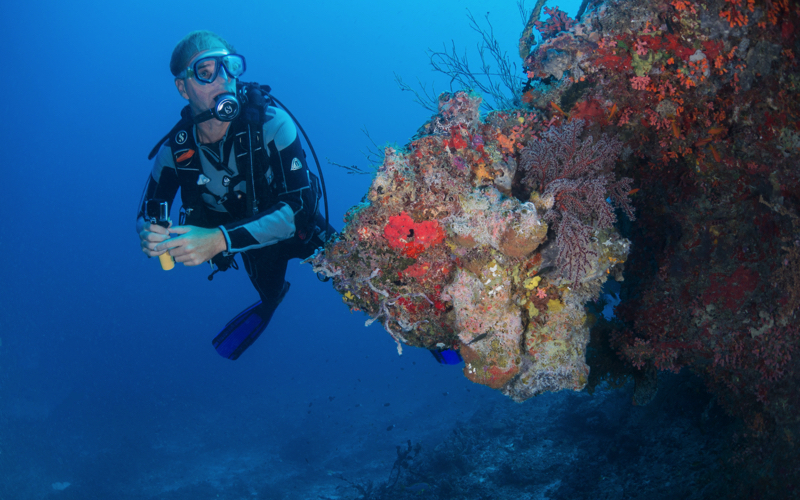 The PADI dive centre offers house reef diving, boat diving, private diving, night diving, fluo night dives, Manta Ray diving and nitrox. The resort runs 3 trips a week to Hanifaru Bay, the place where – in season – the world’s largest groupings of manta rays can be seen. This is also the place for whale shark spotting. 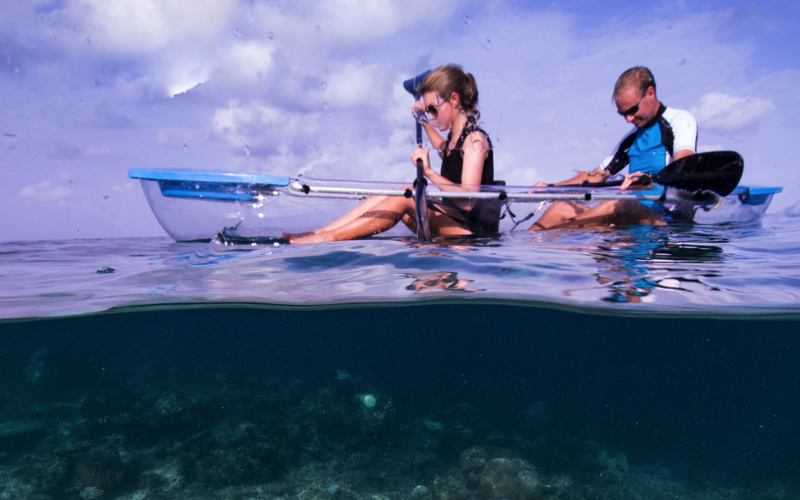 There is also a resident marine biologist, where the curious can shadow her and learn more about the Maldives. Watersports, which include kayaks, windsurfers, catamarans, stand up paddle boards and Zayaks. If you want to try some fishing then the big game fishing boat can take you out looking for wahoo, sailfish, swordfish, giant trevally or marlin for our catch and release programme. 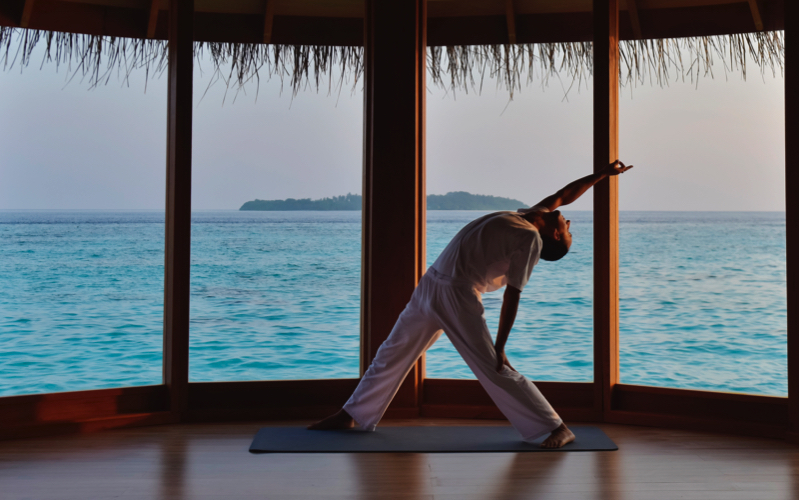 An over-water yoga pavilion hosts complimentary daily yoga or meditation sessions for your wellbeing. The Serenity Spa has 4 treatment suites, offering inspiring views of the sky and ocean. At Milaidhoo Island Resort Maldives there are 3 restaurants, Ocean serves breakfast, lunch and dinner at the edge of the lagoon. Here, the key words are fresh, flavourful and friendly. Ba’theli Restaurant sits overwater and is inspired by traditional dhonis. It’s a memorable spot for an intimate dinner, serving up modern island-inspired cuisine. 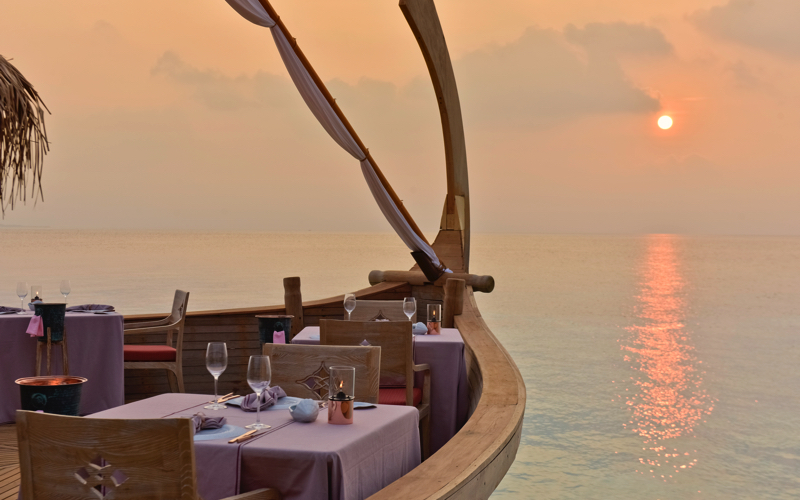 It serves gourmet dishes of inspired from the Maldivian Spice Route. The Shoreline Grill sizzles up premium cuts of meat and fresh local fish, simply cooked, to let the quality speak for itself. It’s also home to the chef’s table and wine cellar. The Compass Pool Bar, next to the infinity pool is the place to chill out. serving refreshing drinks, the freshest of fresh juices, cocktails and light meals, such as pizzas from the wood-fired oven. Milaidhoo Island Resort Maldives will exceed your expectations, contact us today to book your dream holiday at this amazing resort.